When a book containing George Washington’s personal copies of the Constitution and the Bill of Rights was first sold at a Philadelphia auction house in 1876, it was purchased for $13 — about $277 in today’s value, or roughly two-thirds the cost of taking a family of four to watch the mascot version of the nation’s first president race around the warning track at a Washington Nationals game. 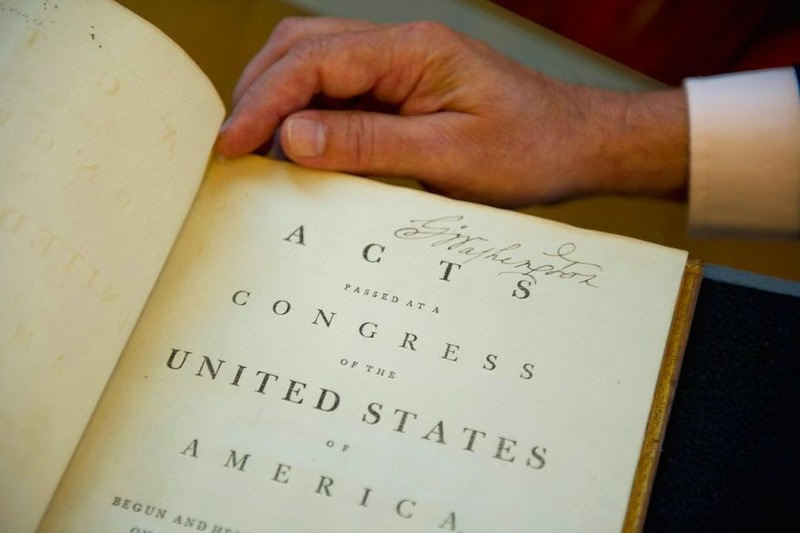 Washington’s book, printed and bound in 1789 and featuring his handwritten annotations, will be sold at Christie’s in New York on Friday and is expected to fetch a winning bid of up to $3 million. “That’s a lot of money,” said Edward G. Lengel, the author of “Inventing George Washington” and the editor of the Papers of George Washington Project at the University of Virginia. “But I think it’s pretty much impossible to understate the significance of this. A bespoke, 106-page leather-bound volume, the book contains a record of the first session of Congress — the ratified Constitution, the draft Bill of Rights and acts creating the executive, State and Treasury departments — as well as a custom print of Washington’s family crest and his signature on the title page. Washington’s annotations make the book unique — and uniquely historic, historian Mary Thompson said. “Washington typically would make notes as he was reading a book on a separate piece of paper,” said Ms. Thompson, a researcher at the Fred W. Smith National Library for the Study of George Washington at Mount Vernon. “He almost never made marginal notes. Christie’s expects the book’s auction to attract as many as 150 private and institutional bidders both online and in person. The auction house counts the book among the most notable items it has ever offered. Others include Abraham Lincoln’s 1864 victory speech and one of Shakespeare’s first folios. Three years ago, a 1787 letter written by Washington to his nephew and heir Bushrod Washington about the Constitution was sold by Christie’s for $3.2 million, the highest known total for a Washington item. A keen student of history, Washington knew his books and letters were important. During the Revolutionary War, he ordered a team of clerks to make copies of his papers and letters for historical reference. After his second presidential term, he began constructing a separate building at Mount Vernon to house his library, which consisted of 800 to 1,000 books and thousands of other documents. So how did Washington’s personal copy of the Constitution end up on the open market, and not in the Mount Vernon library or a place like the Library of Congress? “Without being too abusive, it’s safe to say that his family dropped the ball,” Mr. Lengel said. After Washington’s 1799 death, his library went unfinished. He bequeathed his books and papers to Bushrod, who later served as a Supreme Court associate justice. A respected jurist, Bushrod did not run his uncle’s estate in the manner of a modern museum. Ms. Thompson said Mount Vernon visitors often would ask Bushrod to cut out Washington’s signature from letters. Others would request snippets of the first president’s hair or pieces of one of Martha Washington’s dresses. Jared Sparks, a Harvard historian who published the 12 volumes of “The Writings of George Washington” between 1833 and 1839, famously “borrowed” and later gave away hundreds of Washington’s documents to politicians and influential people, the better to curry favor. Given visitors’ propensity for plunder, Washington’s book containing his copy of the Constitution surprisingly remained at Mount Vernon until 1876, when Bushrod’s son Lawrence sold it at auction along with about 100 other items. Today, Mount Vernon’s library contains 46 books and 450 documents that belonged to Washington. Meanwhile, Boston’s Athenaeum houses the largest collection of Washington’s personal books, which were purchased by the private museum after Bushrod’s nephew George Corbin sold them to a Vermont bookseller in 1848. “People always assume Washington must have kept all his stuff in a sealed vault and subsequent generations must have put a military guard on it,” Mr. Lengel said. “But up to the Civil War, pretty much anyone could walk through Mount Vernon and pretty much take anything they wanted. When Washington’s Constitution turned up at Christie’s, it fell upon senior specialist Chris Coover to both authenticate the book and reconstruct its history. The first task, he said, was easy. The book was bound in 1789 by Thomas Allen, whose shop in New York City was located just blocks from Washington’s presidential residence. Washington ordered three copies: One was given to Thomas Jefferson; another to John Jay, the first chief justice of the Supreme Court. The inside cover of Washington’s copy — known as a bookplate — was made in England and features a colorful design. Pasted atop the bookplate is a print of the Washington family coat of arms and the Latin motto “exitus acta probat” (“the ends justify the means”). Washington ordered 300 copies from a London printer at a cost of 6 shillings, reserving their use for the most important books in his library. After Lawrence Washington’s 1876 auction, the book changed hands in 1892, when it was sold for $1,150. It is thought to have belonged later to newspaper baron William Randolph Hearst. In 1964, Pennsylvania businessman and Colonial art collector H. Richard Dietrich Jr. purchased the book at a New York City auction for $27,000 — roughly the cost of a new home at the time and $200,000 in today’s value. Mr. Lengel said the market for Washington’s books and papers has waxed and waned. In the early 1800s, ample supply kept costs low; by the middle of the century, a reduced number of items made forgeries commonplace; in the 20th century, preservation efforts by institutions and libraries further constricted supply, driving up prices to current highs. Self-conscious about his lack of formal education, Washington was an avid and studious reader who often kept meticulous private notes while absorbing and comparing texts. Nevertheless, Mr. Lengel said, only a few other books featuring Washington’s handwritten annotations are known to exist — most notably a copy of James Monroe’s “A View of the Conduct of the Executive in the Foreign Affairs of the United States,” published in 1797 and highly critical of Washington’s diplomacy with France. “That drove Washington nuts,” Mr. Lengel said. “He wrote very extensive comments, striking back rather savagely at Monroe. His comments were never published. I think they were to clear his mind and let his temper out. For Washington, his copy of the Constitution wasn’t so much a historical document as an employee manual, a guidebook to an office that largely was created with him in mind. The first president was keenly aware that every decision he made would set precedents for his successors, and that faith and trust in government would hinge largely on his careful interpretation and execution of the fledgling nation’s foundational laws. As such, his sparse notations say little — and in doing so, say everything.